Near the entrance to the Oakland Airport you can drive right past this place. In a somewhat seedy strip, the place is immaculate on the inside. Everything is made of old laminate and wood paneling, but is spotless. Classical music plays on the overhead speakers. 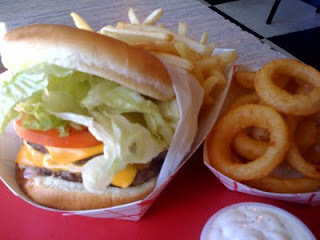 The burger is served neatly wrapped at your table in a neat little red and white basket. The burger patties come with your standard lettuce, tomato, onions and pickles. Mayo is the loan condiment but you can add mustard or ketchup at your table. The burger was very good. Just the right balance of fresh tasting beef and American cheese. It was hard to get my mouth around the stack. Fries were thin, hot but nothing special. I liked the onion rings a little better. Small, battered, thin, crips and hot. I really liked this comfortable old shoe of a place. I read your blog post . it was wonderful. Your ideas process is magnificent. The way you tell about things is amazing. They are inspiring and useful. Thanks for sharing your information and stories.